Do you have a new puppy? Learn everything you need to ease your pet into the family with the best tips for new puppy owners! Since becoming a parent, sometimes I question my judgment, or maybe I should say I question my sanity. 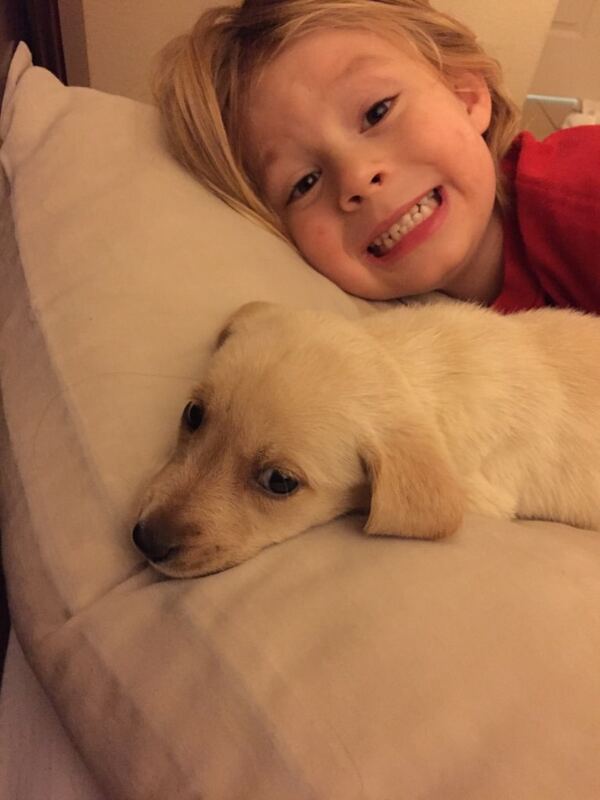 Almost two years ago, when I had a 1 and 3-year-old, we decided it would be a good idea to get a new puppy. We already had an old chocolate lab who we love, named Hudson who will be eleven this summer. Wouldn’t he love a friend? 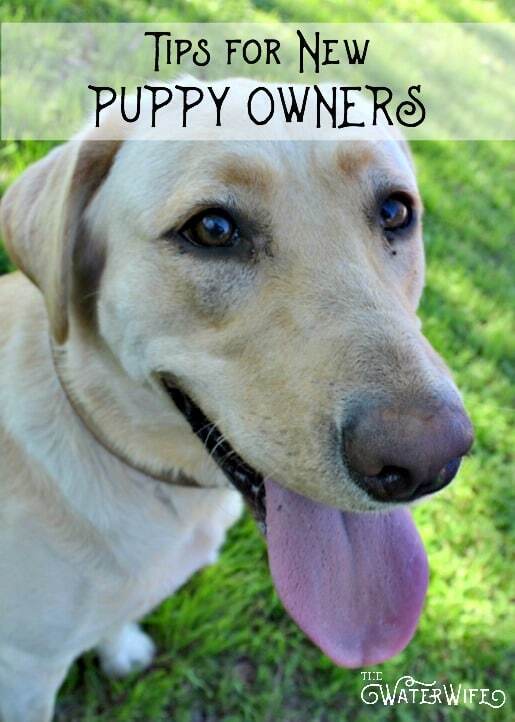 Wouldn’t he love a new, rambunctious, yellow lab puppy my superhero-obsessed son named Honey Flash, to play with!? Not so much. As it turns out, we forgot just how much energy new puppies have and what it is like for new puppy owners. This was our sweet Honey girl and her best friend when we brought her home. The kids loved her, but our older lab took a little longer to adjust, as did The Water Man and I. The hardest part for us was being able to burn off enough of her energy every day. Puppies need to play! We have learned so much! Here are our best tips for bringing home your new puppy and getting all that puppy energy out each day! 1. It starts with food. We currently feed both of our dogs Purina BENEFUL® Original. I love it because real meat is the number one ingredient. Beneful has whole grains and vegetables, so I know our dogs are getting what they need. I trust Purina, and we use their dog food and treats for all of our pups. 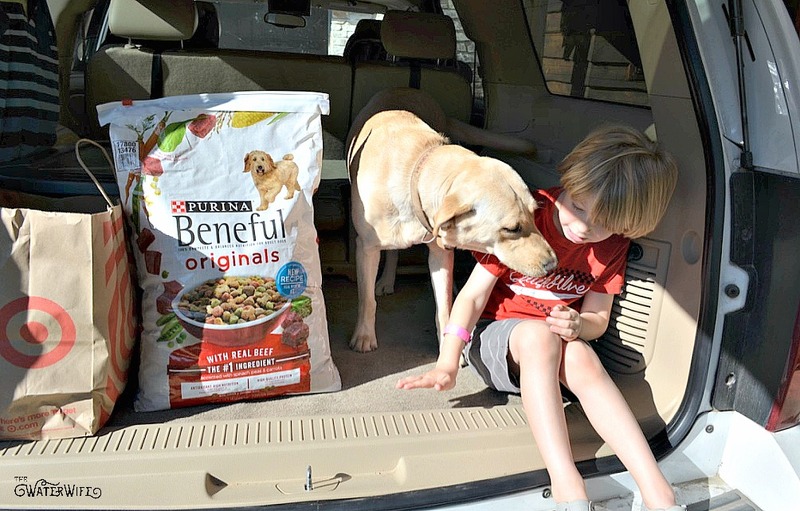 We started with Beneful® Healthy Growth for Puppies when we first brought our puppy home, and she loved it! Whatever food you decide on, there is always a wide variety of Purina dry dog food products at Target in the pet aisle. When I tell you we forgot how much energy a puppy has, I wasn’t kidding! If we missed a day of playing with our girl, she would chew on things or bark all night. You have to get their energy out. As it turns out, that worked out great for our family who loves the outdoors. The kids taught her to play fetch, and they love to run and explore with her! She gave me a reason to get off the treadmill and hit the neighborhood walking more. Every minute counts, so puppies typically need about three 30-minute play sessions of some kind each day. Training counts too because it takes a lot of energy for them to focus on listening to you and following rules when they’re little. I try really hard to have two short training times with her each day, each lesson counts towards one of her three needed play sessions. 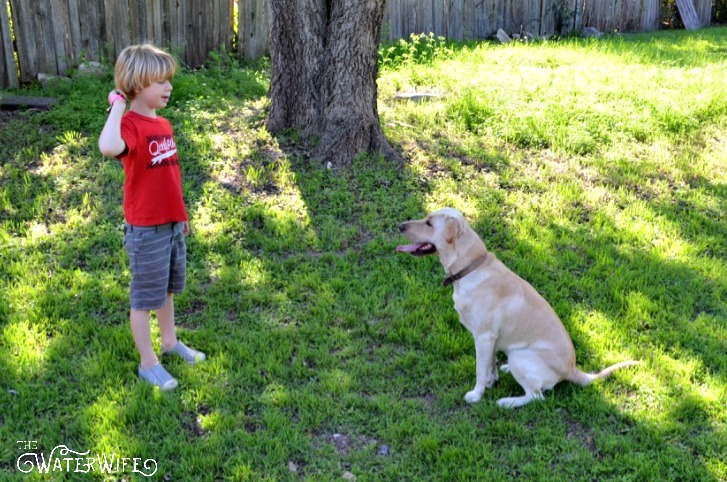 We work on the basics like sitting, staying, not jumping and walking on a leash. Then after we have a lesson, she gets a good rub down, brushed by the kids and a family snuggle! Just the play time and love burns a lot of that energy out and forms a sweet bond with your new pup! When we first brought Honey home, she didn’t want to sleep alone. We didn’t want to leave her with our older lab because he wasn’t quite used to her yet. I will admit a few nights when I needed the sleep; she just snuggled up with me and the kids in bed. She was not potty trained well enough for that, so we had to move her. Once I gave her her own space, she got more comfortable in our home. We gave her a bed, toys and the kids shared their blankets, so she is always cozy. As much as she loves our family, she now loves having her own space, and when she gets tired, she finds her way there. Your new pet will feel safe, even when you’re away if you give them a place of their own. The earlier you start showing your puppy where their space is, the better. The first couple of nights might be hard, but they adjust quickly and will be sleeping soundly in no time. The kids (okay, and me) still love to pick out treats and toys at Target for our furbabies! This is a big one. I struggled a lot with being consistent with a new puppy in the house and having little kids. I found it very challenging to train a puppy with toddlers for assistants. But if I miss a day of playing, training or loving on Honey, it shows, by how restless and anxious she is. She will be two in October, and I know she will calm down more and more as she ages, but for now, we still have a big puppy on our hands. Be consistent with your new puppy. As a dog owner, it is hard to devote that time and attention to a new puppy every single day, especially more than once a day. But it will be worth it. You and your puppy will sleep better. 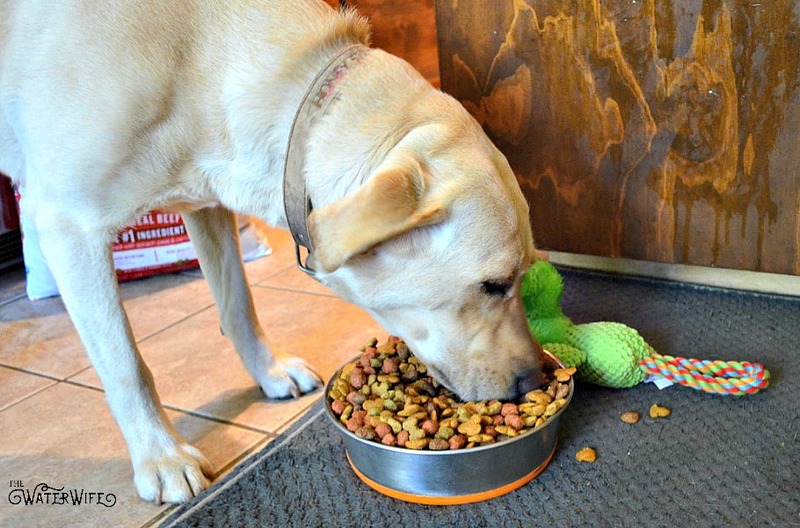 Your puppy won’t have the energy to chew on more than their toys, and your pup will bark less. So be consistent with your training and play every single day and with time they will calm down, and your efforts will pay off! With time, our old lab learned to love his new play companion, and it’s nice that he helps to get some of her energy out. We still make plenty of time to play with them both; they are part of our family. Bringing home a new puppy is a transition but it doesn’t have to be a headache.